YouTube has expanded its High Dynamic Range support to Apple’s latest OLED smartphones, the iPhone XS and the iPhone XS Max. The new support comes only a few months after YouTube similarly launched HDR for the iPhone X. Upon updating, YouTube mobile users with one of these new models can watch the HDR version of videos when available. The new phones were released on Friday, and in the few days since launch, users have noticed that they couldn’t play high dynamic range content from the service — whereas the iPhone X, 8 Plus, 8, and iPad Pro all can. YouTube didn’t have HDR ready in time for Friday, but thankfully the company didn’t take long to roll out compatibility for the wider color gamut and more vibrant, splashy video. It took YouTube until May to introduce HDR support for the 2017 iPhones after it debuted on Android last September. 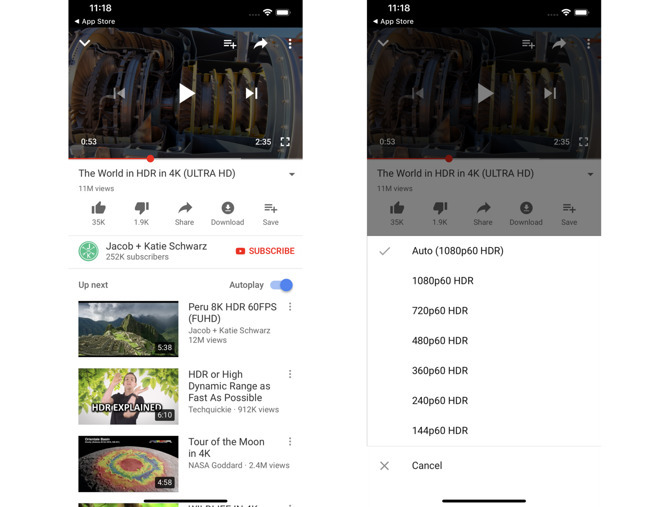 The highest resolution you’ll be able to get from YouTube on either new iPhone XS model is 1080p. The problem is likely to be down to Apple’s lack of OS-level support for Google’s VP9 codec, used by YouTube. While it remains unclear when or even if Apple will include VP9 support in its software and devices, it is also unknown if Google will work around Apple’s decision not to use the codec in software as it has done on the Xbox One, if only to enable 4K or 1440p video streams on hardware that could play it.